Yup, black matte cutlery seems to be the color that’s cool this year again. And Knork really seems to have to corner edon that market and boy are they ever selling a lot of flatware. 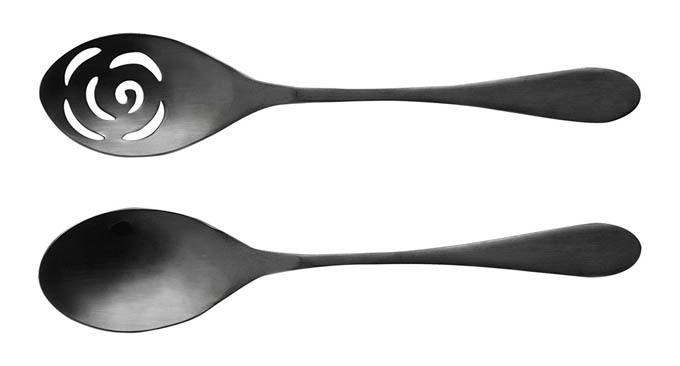 This two piece titanium serving set caught my eye due to the very cool design on the slotted spoon. Although I have no idea what dish it would look good in, black is hard to pair with foods. The hand forged set uses a titanium coated technique that is PVD and is dishwasher safe and scratch resistant. What is PVD you ask? PVD coating is a plasma coating deposition technology. Vacuum Coating. The materials are vaporized under vacuum coating conditions to obtain a PVD coating. A vacuum chamber is necessary to avoid reaction of the vaporized material with air.